Like mud? Try enlarging the pond in the wildlife area of the Demonstration Garden on a cool Tuesday morning. 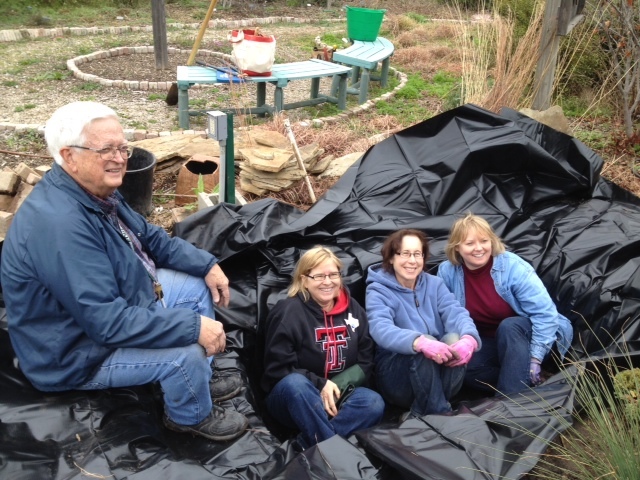 The dirt—well mud—was flying as Jim, Michelle, Sue and friends dug out the pond and added six-inch shelves for bog plants. After adding a thick new liner, the pond is perfect for a picture for DALLAS GARDEN BUZZ! Gardeners arranged flagstones around the pond edge to hold the liner, filled the pond with water and returned aquatic plants, and installed a new pump with a fountain head. Whew! As Jim commented, that’s a lot of work! Vegetable updates: Radishes and lettuce planted last week are up and growing; carrots are taking their time to sprout. Onions and leeks planted a few weeks ago are doing well; the spring potatoes have not made an appearance yet. Master Gardeners also worked to trim back roses and grass, pull weeds, and start rose cuttings for the May plant sale. We had a great turnout (welcome interns!) and good productive workday in the Demonstration Garden. Posted in Wildlife Habitat and tagged Garden Pond, Leeks, onions, vegetable gardening. Bookmark the permalink.